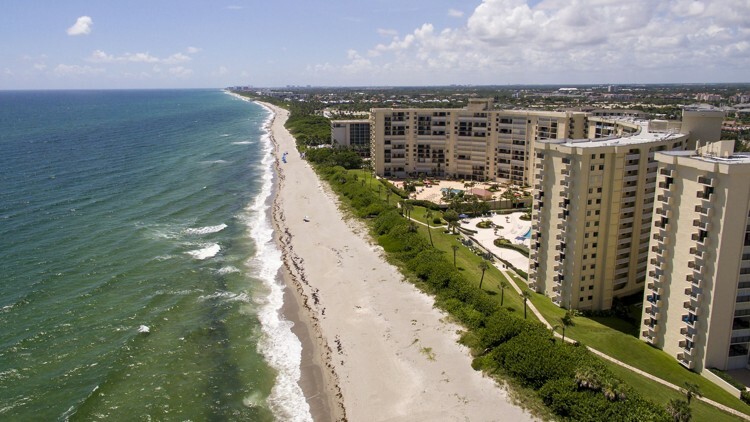 JUPITER — The town is ready to resubmit to the state its coastal management comprehensive plan text amendments that address planning as it relates to climate change. On Tuesday evening, members of the planning and zoning commission board unanimously voted to amend three existing policies and add four new policies to the town’s proposed Coastal Management Element. Changes to one existing policy explain that the town will make sure any construction seaward of the Coastal Construction Control Lines will follow local and state code. Another change to existing policies extends the deadline for the town to “investigate the feasibility of integrating consideration of climate change impacts, and adaptation and mitigation strategies, into existing comprehensive plan goals” as well as how the town can use Adaptation Action Areas to find which parts of Jupiter are most vulnerable to storm surge and sea-level rise. The deadline was originally December 2018, chosen to follow Palm Beach County goals, but the town says the county has not implemented Adaptation Action Areas into its comprehensive plan. The proposed new deadline is December 2020 to “allow more time to evaluate the aspects of Adaptation Action Areas, wait for potential future funding, and provide for consistency with any similar efforts being implemented by Palm Beach County,” according to the staff report. Under the new policies, the town will implement strategies to mitigate and reduce flood risk; use engineering like stormwater drainage improvements to reduce flooding in coastal areas; use South Florida Regional Climate Change Compact maps that detail sea-level rise in Jupiter at one foot, two feet and three feet when investigating coastal flood risks; and be equal or stricter in flood-resistant construction requirements written in the Florida Building Code. On the matter of construction requirements, town staff noted that the state requires new houses be built at least one foot above base flood, but the town requires new homes to be constructed at 1.5 feet above base flood. Jupiter first adopted its climate change objective in 2015. “The overall design of that was to increase the town’s resilience to climate change and sea-level rise,” said Garret Watson, senior planner with the town. That same year, the state mandated municipalities to add climate change objectives into their comprehensive plans under the “Peril of Flood” legislation, Watson said, which required “the incorporation of principles for eliminating inappropriate and unsafe development in coastal areas due to the risk of future flooding,” according to a staff report. When the town tried add a Coastal Management Element to its comprehensive plan in 2016, the Florida Department of Economic Opportunity, which oversees planning decisions, denied the application, saying the language was not strong enough. The town then hired Boca Raton-based engineering consultant Hazen and Sawyer to create a 31-page report looking at its stormwater master plan, town code and comprehensive plan as they relate to addressing sea-level rise and climate change. Watson told planning commissioners that the town already considers climate change impacts and coastal flooding during the planning process, but approving these amendments would make this practice officially known with the state. Jupiter also continues to take recommendations from the Southeast Florida Regional Climate Change Compact, he added. These comprehensive plan amendments will go before the town council for first reading on Sept. 20. Follow reporter Hannah Morse on Twitter at @mannahhorse.